Ian Thompson, a Madonna employee and director of the Physical Therapist Assistant Program at Southeast Community College, recalled over the years how much his grandmother believed in him when he was growing up. As a graduation gift, Betty Sweinimer gave Ian funds to invest in his education. To honor her memory and pay it forward for others, Ian and his mom, Vikki Harsh, (also a Madonna employee) established the Betty A. Sweinimer Memorial Scholarship at Madonna. 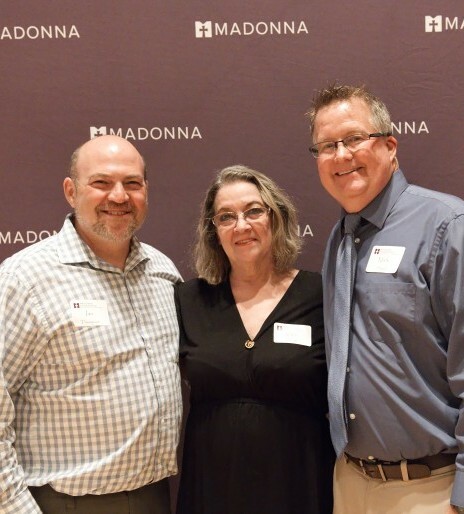 Now in its fifth year, two Madonna employees were presented with the scholarships at the Angel Spotlight on May 8. The recipients are Coleman Lay and Kaylea Speckmann. Coleman Lay is a rehabilitation associate at Madonna’s Omaha Campus. He is working toward his doctor of occupational therapy degree at Creighton University. Kaylea Speckmann is a nurse aide at the Lincoln Campus. She will be applying to physical therapy school. Congratulations, Coleman and Kaylea. The Madonna Foundation extends a big thank you to Ian Thompson and Vikki Harsh for making this scholarship possible.